Hifisounndconnection now offers OEM Factory Radio solutions. All Factory radios include a 30 day warranty and are tested before shipping. These units are Used models with only minor cosmetic problems which will not affect the performance of the model. Will this radio work in my vehicle? The suggested application guide located at the bottom of the specifications will list the vehicle(s) that will accept this stereo. If your vehicle is not listed then we recommend giving your dealership a call. It may still work, but we cannot guarantee a fit. My radio is broken, how can I guarantee this radio will work in my vehicle? If you are replacing a broken radio, remove the broken radio and locate the radio's part number on the back. If the number on the broken radio's casing matches the numbers in this listing's suggested application guide, we guarantee it will fit. If the numbers are NOT on this listing then you can search for this part number with our search bar on our site and find a guaranteed fit for your vehicle. You can also call the dealership with your VIN and they would be able to give you the part number for your radio. My vehicle has no radio, I want to add one, how can I guarantee this radio will fit my vehicle? If you do not have an existing radio to compare part numbers you will have to call your dealership, and provide your vehicle's VIN number. The dealership will then be able to provide you with the part numbers that will work with your vehicle. You can then search for this part number and find a guaranteed fit for your vehicle. The picture looks the same as my radio; will this work? Keep in mind that the image on the listing is only a reference, the only way to guarantee a proper fit is to use the suggested application guide. If your year range is not listed we do not recommend purchasing this unit without first contacting your dealership. We also recommend matching the harness on your existing radio, to the one pictured the listing. Many radios may look similar but have different interfaces and harnesses. Will I receive the radio in the picture? No, the picture is used for reference purposes and will not be the exact model sent. 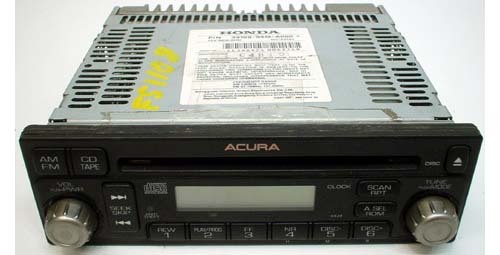 Some pictures may show a six disc changer or AUX however if the suggested application guide does not have this listed, the radio will not arrive with the 6 CD or Aux. It is always a good idea to look at the suggested application guide before purchase. Since these are used units they may come with minor blemishes. My radio arrived locked, what do I do? All of our OEM factory radios are used and unfortunately do not come with unlock or anti-theft codes. This is a security feature that only dealerships can unlock for theft prevention purposes. You need to get in contact with your dealer and they can unlock this for you. Most dealerships charge for this service and the charge will vary depending on the dealership. Can I upgrade from a cassette and CD to 6-disc/AUX/Navigation? In many cases you can upgrade from a single disc to a six disc player, however this is not always 100% true. To ensure a proper fit you will need to call the dealership and confirm that your radio can be upgraded. Generally you cannot go from non-navigation to navigation without an additional harness. Can I upgrade my non-premium radio to a premium radio (Bose, Infinity, JBL, Shaker, Monsoon etc.)? Or vice versa? No, unfortunately the premium versions of the same stereos will not work. 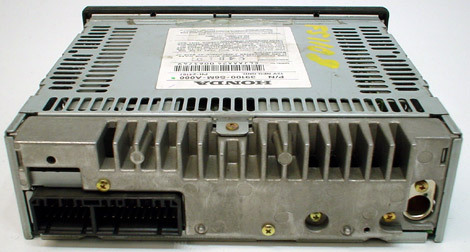 For example, a listing may be for a premium version of your original unit such as Bose or Monsoon. Make sure and always consult the suggested application guide for the specifics. Here is a list of premium sound systems: Bose, Infinity, JBL, Mach, Monsoon, Shaker, Rockford, Alpine, Blapunkt.